On 10 February 2017, two versions of the Declaration of Orientation were printed to announce the relocation and revival of The Heavy Duty Press’s letterpress shop in Liberty, Wisconsin. The print shown above is from a limited edition of 40, with tactile impression on 300 gsm Hahnemuhle Copperplate 100% alpha cellulose acid free paper. Copies from this edition were mailed to a personal list of special collections librarians. 5 copies remain for sale. 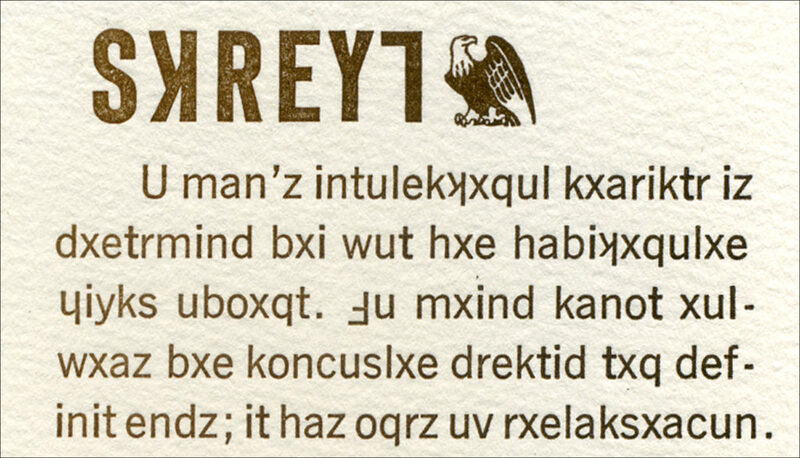 6″ x 16″; the type is hand set in Century Expanded, with a header in Bank Script. The classic thirteen virtues of Benjamin Franklin, hand set in genuine 12 pt. ATF Century Expanded and Franklin Gothic lead type with a variety of ornamental rules and flourishes, an assortment of acorns and leaves, bi-racial fists, a couple stars, the liberty bell, and a turkey (Franklin’s known preference for the national bird). 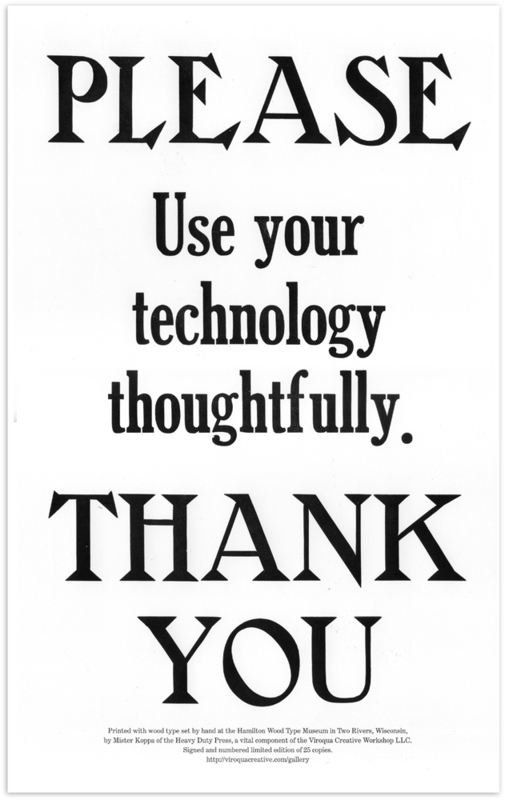 Printed with black ink on 15″ x 6.25″ laid finish paper with pastel flecks in pinks, purples, and blues with the Vandercook SP-15 in 2001. A screamin’ deal at $3/virtue. The borrowed text on this print is set in Earthish, a Midwestern English dialect-reading phonetic alphabet developed within the editorial pages of The Sphere in the early 1990s. The alphabet was subsequently refined and the rules finalized in the private journals of Mike Koppa. This is the first time the alphabet appeared in print (2003), and as of 15 November 2016, it remains the only time. The alphabet was designed, from the beginning, to use only existing characters in order to be used with existing hand set type. This broadside is set in (mostly) ATF News Gothic, with Century Old Style characters when it became necessary. Vowels have only two sounds, long and short, and the q has become an additional 6th vowel to cover the 2 “oo” sounds. Each vowel has a default “short” sound and a “long” sound, which is indicated by a preceding silent x. This is the only use for the letter x: a silent indicator of a long vowel sound. The x is the only modifier of a vowel sound. Y is the ng sound. A man’s intellectual character is determined by what he habitually thinks about. The mind cannot always be consciously directed to definite ends; it has hours of relaxation. There are many hours in the life of the most strenuous and arduous man when the mind goes its own way and thinks its own thoughts. These times of relaxation, when the mind follows its own bent, are perhaps the most fruitful and significant periods in a rich and noble intellectual life. The real nature, the deeper instincts of the man, come out of these moments, as essential refinement and genuine breeding are revealed when the man is off guard and acts and speaks instinctually…. The rest is left as a challenge for anyone interested in finishing. 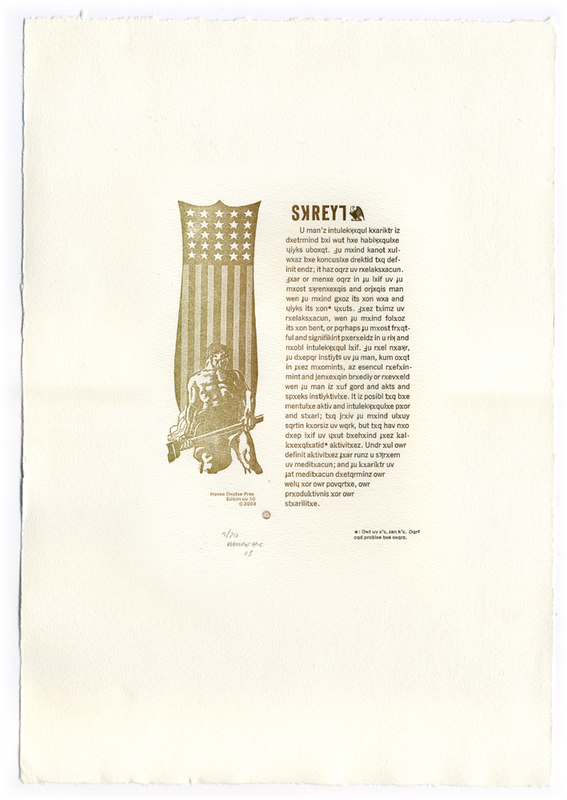 16″ x 10″ broadside printed from wood type set by hand at the Hamilton Wood Type Museum in Two Rivers, Wisconsin, in 2011. Signed and numbered limited edition of 25 prints.